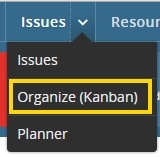 Twproject is a perfect solution for an Agile approach to project management and issues/to-do can be managed with Twproject multi-dimensional Kanban. See how, on: Twproject and Agile methods, SCRUM and Kanban. Kanban is a method for managing knowledge work with an emphasis on just-in-time (JIT) delivery while not overloading the team members. In this approach, the process, from definition of a task to its delivery to the customer, is displayed for participants to see. Issues will be presented in distinct columns, e.g. by severity. You can change their severity by just dragging them around. You can arrange issues by task, assignee, status or severity; this makes of Twproject, a Multi-dimensional Kanban really flexible. Depending on the dimension you want to use, there are several typical use cases. a) imagine to have a product and you want to plan features to be released across next product releases: Collect all the feature on the “My product” project and the plan of your releases say “rel 1”, “rel 2” and “rel 3″. Filter by task=”My product” and subtasks. Then add columns for the releases. Drag and drop your issue to distribute them on the next releases. b) imagine to have an help desk that collects user issues/tickets/requests on a single project. Consider that you can receive issues on a project by linking a project to a dedicated mail account or by activating a project public page. The project responsible could spread the issues received on specific sub tasks where the “worker” will start resolving/responding to each request. By assignee: is useful when issues/ideas are collected during meetings, or in general in a short event, instead of write on paper. In this way everything is ready to be used in Twproject. When the project is ready to start you can, eventually, assign the issues/ideas to the resources responsible to solve/develop them. By status: is a less common use case, but when you use several statuses for identify different phases of issues resolution process, you can move them fast along the process. Every change will be saved immediately, and the issue history will keep track of all your changes.